Evolve and up-skill your knowledge, skills and abilities with a wide range of fun, social women’s only seminars or clinics. Whether you prefer road or MTB, these skills courses are a great way to boost your confidence and improve your technique and skills. This is a great course for beginners, instructed by local cycle safety guru Marilyn Northcott (from En Velo). They're perfect if you’re new to biking, would like to get more confident on your bike and learn all the basics. Ever wondered how those riders stay together so seemingly effortlessly? This course will teach you all about road etiquette (eg hand signals, avoiding "hazards", maintaining the right distance etc. ), rotation systems for riding in a bunch, and other useful tips to enjoy riding in a group. 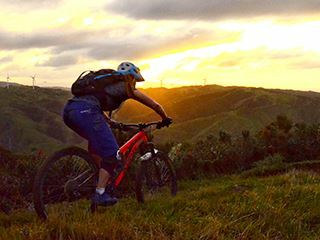 JoyRide offers mountain bike skills courses for women. Each course focusses on a different element of trail riding. We believe the best way to learn to mountain bike is to mountain bike. So our skills courses are a bit different…we go for a ride, stop at various points along the way for a chat. We demonstrate a specific skill, then give you a chance to try it out in the next section. Each course is limited to six ladies (1:6 instructor ratio). Costs: $105 or $85 for Revolve Members. Covers basic, key maintenance including how to change a flat tyre, how to clean what, and learning what those odd parts of your bike are called. For those who want to know more – how to mend chain breaks, look after disk brakes and tune those gears for a sweeter ride. These courses are being held several times throughout the year and dates are announced in the weekly Revolver. If you just can’t wait, send us an email to show your interest.